The Cardinals had hoped to take a longer look at No. 4 prospect Tyler O'Neill in Spring Training. But the power-packed Canadian had oblique and hamstring injuries that limited him to 12 at-bats. 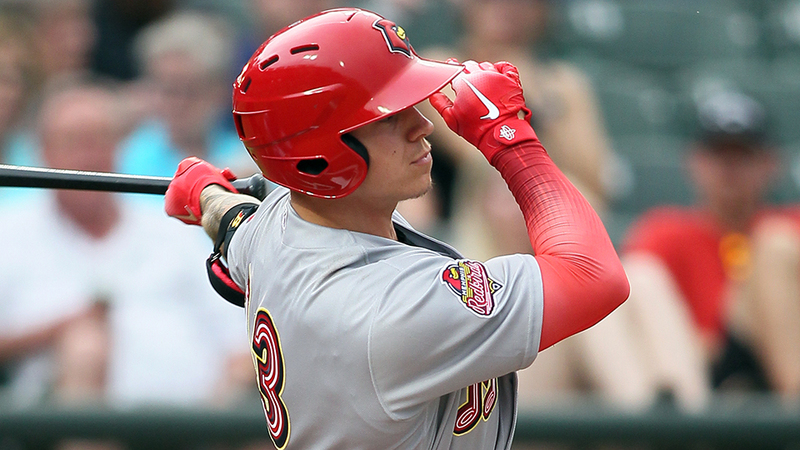 He's hoping to open eyes at Triple-A Memphis and took a big step in that direction Friday with two homers, a double and five RBIs as the Redbirds scored 12 times in the seventh inning en route to a 17-3 thumping of Round Rock at Dell Diamond. The 22-year-old hit two-run homers in the third and fifth innings, both times scoring Max Schrock, who had four hits. O'Neill, who has nine career two-homer games, danced around whether he was thinking about a third round-tripper. "I mean, I don't know how to answer that. When I go up to the plate I want to stay short to the ball and not get pull-happy," he said. "That was honestly my approach when I got the second home run, which was to the opposite field." His double also plated Schrock in a raucous seventh inning in which the Redbirds had seven hits and took advantage of two wild pitches, an error and a passed ball. The 12-run frame was the first time Memphis had scored in double digits in an inning since plating 10 at Reno on Aug. 4, 2011. Following his monster night at the plate, O'Neill admitted he was disappointed he didn't get to show the Cardinals all he can do this spring. "Of course, I mean everybody wants to make the team out of spring, but that's just the way things went," the British Columbia native said. "They told me to go down and get some valuable playing time. I think getting reps is the most important part." Acquired last July from the Mariners for left-hander Marco Gonzales, O'Neill blasted 31 homers in 2017, including 12 in 37 games with Memphis. The Cardinals' outfield depth was not lost on O'Neill, nor was the idea that if he stayed in the Mariners organization he might now be in the big leagues. "It is what it is," he said about his reaction to being traded, as well as the deal for Marcell Ozuna. "The only thing I can control is my playing time." Amid all of his offensive exploits, O'Neill also takes pride in his defense, affirming he can play left, center and right. "I'm not worried where I play and neither are the Cardinals," he said. "It's just about reaffirming that I can play all three positions. Not sure where I'll end up, but I've been stuck in left field the past couple of days." Schrock, the Cardinals' No. 10 prospect, also drove in a run, while 11th-ranked Randy Arozarena had two hits and three RBIs in his Triple-A debut. No. 3 prospect Carson Kelly walked three times in support of No. 6 prospect Dakota Hudson (1-0), who got the win after allowing three runs and six hits in 5 1/3 innings. Kevin Herget, Sean Gilmartin and Andrew Morales followed Hudson with 3 2/3 innings of scoreless relief. The Redbirds have scored 25 runs in the first two games and were 7-for-15 with runners in scoring position Friday.